George and Liana meet during their freshman year at a small college. They fall in young love, which completely sweeps George (who is incredibly naive and blindly in love with this terrible girl, so we will call him Nice George) off of his feet. After spending a week in bed together, they go their separate ways–and then George finds out that Liana is dead. He is devastated. He goes to her hometown, only to learn that someone died…but it wasn’t Liana. Their young love had painted a picture that was very different from Liana’s violent reality. Then comes the whole suspicion of murder and Liana skips town. Nice George is living a normal life as a single business manager who is still in love with Liana. I guess a week in bed does that to a person? I have no idea. Out of nowhere, she appears, asking for George’s help. She’s stolen a chunk of money and has several people who are trying to kill her on her tail. She claims she wants to return the money, but she’s so scared. So Nice George does it, and then it all hits the fan. I liked the characters, but didn’t love them. Liana was terrible, in the best way that Peter Swanson could have written her. Every nasty, cruel thing she did made me cringe—from framing Nice George for multiple crimes to lying to virgin George about it being her first time, too. She is a habitual liar and generally terrible woman. She was very good at manipulating Nice George and using his weaknesses to get what she wanted. Nice George’s naivety and lovestruck blindness grated on my nerves, but only because I don’t have the patience for that type of behavior. I really enjoyed Swanson’s writing style; descriptive, insightful, beautiful. This occasionally slipped into some flowery writing, but that was far and few between, and not enough to be a turnoff. Overall, it was a suspenseful, chilling read. There were some Gone Girl echoes, but really I think that was just the “chill” factor. If you’re into suspenseful books, this one is for you! Learn more about Peter Swanson on his website or Twitter. 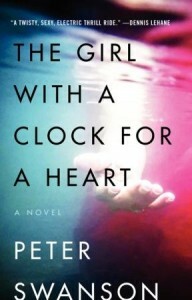 You can buy The Girl With A Clock For A Heart on Amazon or Barnes & Noble. I received a free copy of this book through TLC Book Tours in exchange for an honest review. This sounds like the kind of book that would keep me reading LATE into the night!